The theme of our year, became the theme of our Christmas. As many of you know, we made the tough decision to stay in Oregon for the holidays due to a busy year leaving us a little short. Short of time off work, short of funds and slightly short of energy! So, we decided to make the most of what might very well be a one-of-a-kind Christmas with just us :)! 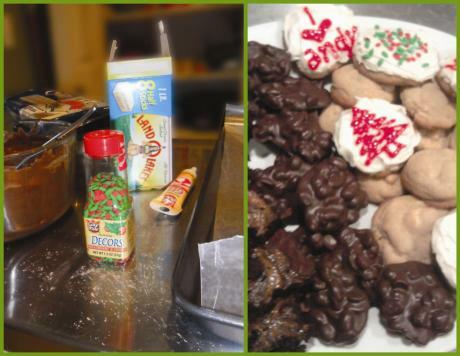 We began our festivities on Christmas Eve with something new... baking together. We baked our old favorites from back home and filled a Christmas platter full of goodies! 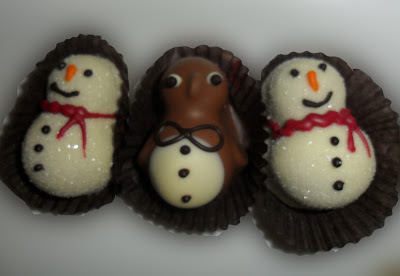 From there we visited Moonstruck Cafe and tried something new; rich hot chocolate (that you can only justify on Christmas) and delicious truffles. I'm pretty sure our Christmas bliss was contagious when the kind girl at the counter offered us adorable truffles as a gift for coming in on Christmas Eve. I believe Andy's words were "It's a Christmas Miracle!" With a familiar sugar high in tow, we headed to downtown Portland to check out Christmas lights. Christmas in Portland. Not quite the Winter Wonderland that we enjoy in Iowa! We ended our evening cashed in front of an old favorite, The Muppet Christmas Carol! Christmas morning came bright and early as Andy's eyes opened with excitement around 6 am ready to exchange gifts. We enjoyed Andy's mom's breakfast casserole before exchanging gifts with each other and my family via Skype! 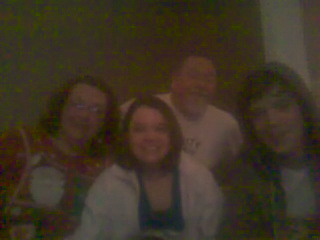 After a Christmas nap, we were excited to Skype with Andy's family - some in Hudson, Ia and some in Michigan. So fun to see everyone even if it is through a computer! Our evening ended with Oregon wine (a new tradition? ), a delicious dinner and tons of laughter (VERY old traditions!). How blessed we have been this year.